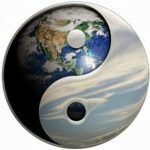 This post compares the development of a newborn child with the development of anything new as predicted by the I Ching. A new-born child has physical and psychological characteristics inherited from its parents, but from the point of view of awareness, of consciousness, it is pure, it is whole. It has no sense of identity as a separate individual, no sense of being an ego. Its behaviour is totally natural. When hungry it cries for food, when tired it sleeps, when it’s necessary to dispose of its body’s waste products, it does. No question of whether it is right or wrong, convenient or inconvenient, acceptable or not. It just does what it needs to do. But, it has arrived in a world of opposites, which to the child presents as survival versus non-survival. Its basic, innate drive is to survive, but this survival depends on others and so it begins to modify its natural behaviours so that those others will continue to provide its survival needs. This is the beginning of an awareness that it is a separate being, the beginning of being conditioned by others to conform to acceptable standards of behaviour, the beginning of the ego. The child is new. It has no previous experience on which to draw. This is also true for anything new, a life, an idea, a project, even a new thought. In the I Ching, hexagrams 1 and 2 are the two energies which govern the manifestation of all things in our universe. Hex 1 is the creative energy which originates the change, and Hex 2 is the flexible, receptive energy which completes the change. In the I Ching, they are hexagrams 1 and 2, pure, separate and non-interacting. This could be thought of as the ‘time’ before there was anything manifested, before the Big Bang perhaps. At some point, something changed, something moved and they interacted. This first interaction manifested something new. From the perspective of the I Ching, this process represents ‘Difficulty at the Beginning’ of something new, which is Hexagram 3. The original pictogram shows a seed which has sent its root deep into the ground and its shoots upwards, diverting around an obstruction before breaking through the surface of the ground (horizontal line) into the light. A perfect image for difficulty at the beginning of anything new. The Hexagram Symbol consists of two three-line symbols, trigrams. The upper trigram represents ‘Water’ and the lower trigram ,’Thunder’. The ‘Water’ trigram represents rushing water, as in a ravine, rushing towards an abyss. As the upper trigram, it also represents above the world, in this case perhaps dark threatening clouds of the storm. Its energy represents the challenge of the new. The ‘Thunder’ trigram includes lightning, the passage of which through the air fixes nitrogen converting it into nitrates, i.e. fertiliser, providing nourishment to the new, in the world. It’s also the first sign of the bottom yang line, the creative energy, entering into the Earth trigram. As it develops the child is subjected to more and more conditioning from ‘authority figures’, parents, teachers, religious leaders, police, government – the list goes on, and the child develops ways of coping, surviving this process. These coping strategies are recorded in the unconscious mind together with the memory of the original trigger, which memory may fade, but with the feelings and emotions that were associated with the experience, which do not fade. Whenever faced with a similar situation during its life, it will automatically feel the emotions associated with the original experience and react based on its original survival strategies. Thus habitual responses are established – habits or defects in its original state.. Note that this is behaviour controlled by the unconscious mind. It is estimated that about 95% of our behaviours are driven by unconscious strategies based on past experiences. The child’s original state was pure – the truth, the real reality, from ‘above’ the world, the creative source. It is represented by the Yang line in the centre of the ‘Water’ trigram. Its conditioned state is false – not truth. Here, in the world, its truth is obscured by the conditioning represented by the two Yin lines constraining it. The process of ‘Personal Development’ or ‘Enlightenment’ involves the removal of the layers of conditioning, much like peeling the layers of an onion, learning to distinguish between the True and the False. If we can achieve this awareness, we can still function within the world, but we are no longer controlled by the false – by the conditioning. This is what is meant by being ‘In the world but not of the world’.